A long time ago, I was feeling overwhelmed after discovering that Katerina had a very rare genetic disorder. She'd successfully battled her congenital heart disease, and following, it was determined that she had a microduplication on Chromosome 1. The geneticist explained how fortunate Katerina was that this would not affect her brain, only her muscular and skeletal systems, and perhaps her kidneys. The human genome world to me is like outer space, a vast universe of power and unknown. This is how I feel when yet another issue surfaces for Katerina. Her legs are growing at different rates which often causes her pain, and there are a few other issues, but Nikos doesn't want me to share them publicly. As her mom, as any mom feels, we never want our children to suffer. That afternoon, while our sweet Katerina was still in diapers, I felt such a deep sadness, scared for Katerina's future, because this genetic disorder is one in more than a million. Nikos put his arm around me and said, "Rebecca, Katerina will be fine. 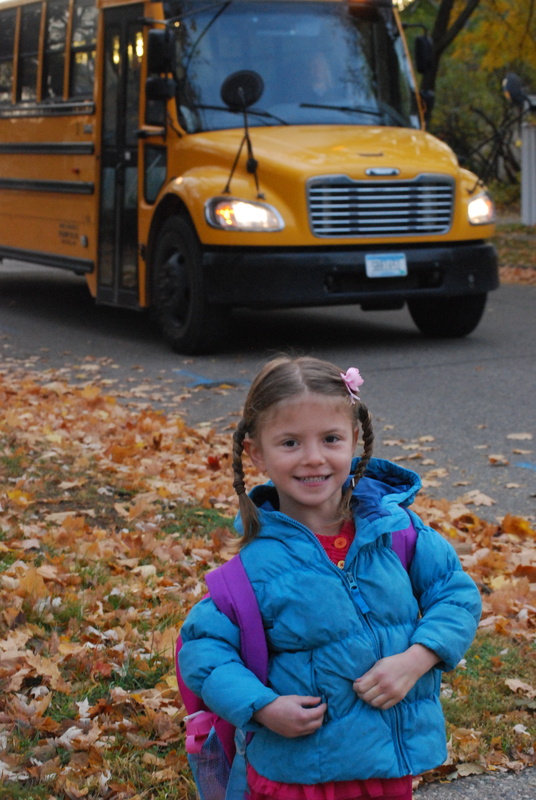 Our tough baby girl will go to dance class, ride a bike, and one day, she'll even take the school bus." 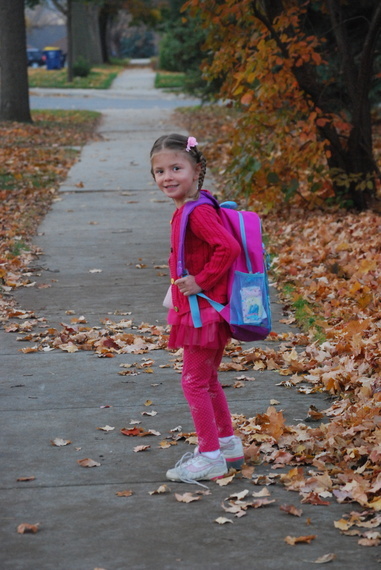 That day arrived, last Friday, October 24th, Katerina announced that she was ready to ride on the school bus! 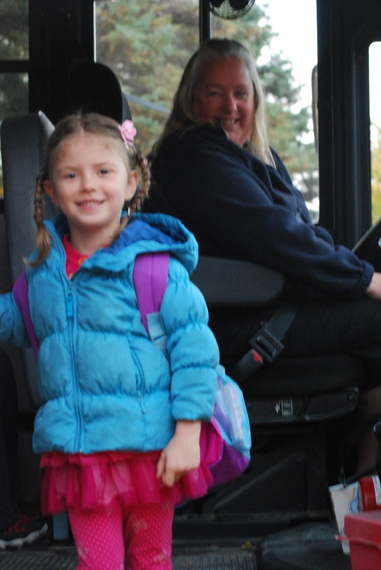 Apprehensively, I asked her if she knew what and where to go once the bus arrived at school. Katerina may have been ready but I sure wasn't! 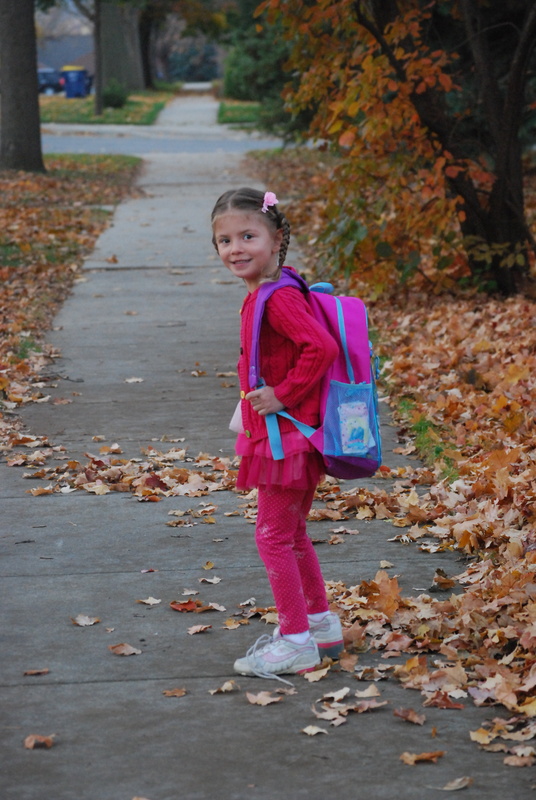 My brave little girl, so tiny yet mighty, was indeed determined to find her bus stop and face the big yellow bus. 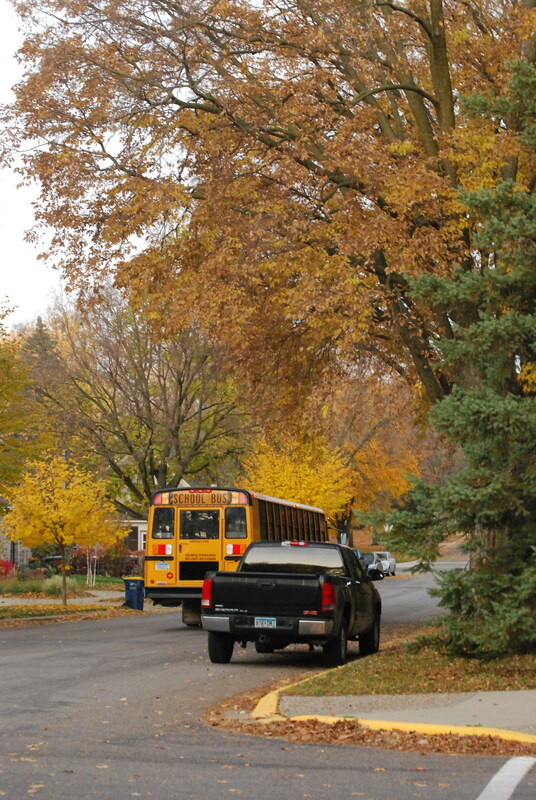 The autumn chill made us both shiver as we walked one house over to the bus stop. I silently prayed that she wouldn't have a grump for a driver. Katerina was shaking and admitted that she was very nervous, but she was also smiling excitedly. I double-tied her shoes and wondered when Katerina would realize that it wasn't the coolest trick, when she could finally do it herself. The big yellow bus pulled up, the doors opened, and lo and behold, the bus driver was Becky from church! Her kind and lovely face was about the most welcome greeting I could have imagined! I explained to Becky that it was Katerina's first time riding the school bus, and she answered, "I know it is." Katerina turned so I could take a picture, and I watched her sit in the second row. I said goodbye and waved at Katerina, but she didn't see me. The bus roared on past me, the autumn foliage blurred through my tears, and there she went, my baby girl no longer, rather a healthy, smiling and growing little bird fluttering her wings and taking flight. p.s. When I picked Katerina up from her half day of school, she excitedly reported that she loved the school bus. She said the big second grade boy held her hand all the way to school and even until they walked to the playground. Another boy teased him and asked if they were going to get married, but Katerina's new friend stood up for her and said that she was a little scared riding the bus for the first time.